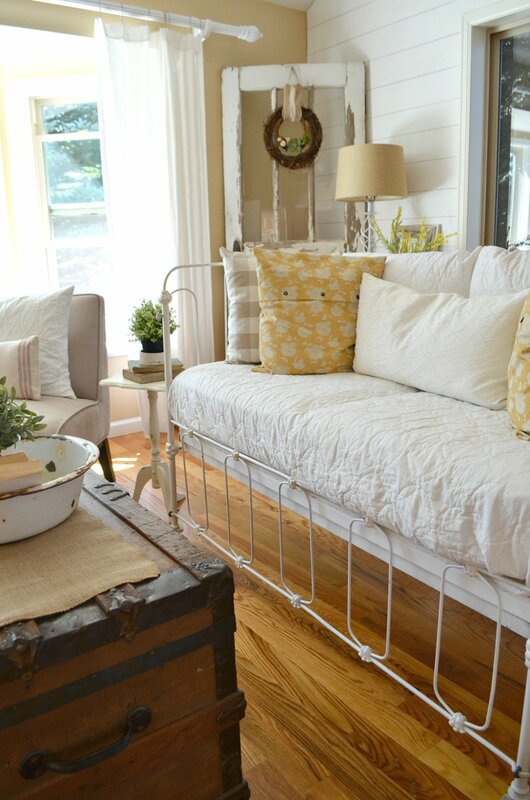 It’s time to have a little chat about lead paint and vintage decor my friends. You all know I love my vintage goodies. And I’d guess if you’re here reading my blog you’re probably a fan as well. (High five to that.) 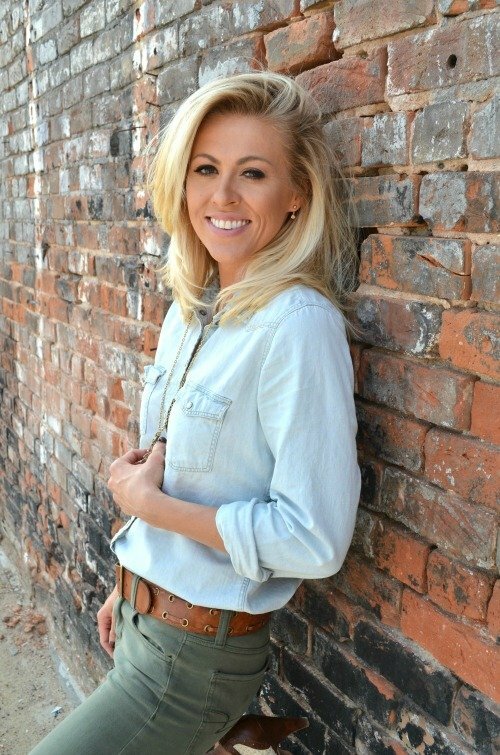 But as much as we all love vintage, the truth is that lead paint is something to be concerned about–especially if you have cute little people running around your home like I do. So I figured it was past time to get my booty in gear and check my favorite vintage decor for lead paint–something I’ve been meaning to do for a while now. 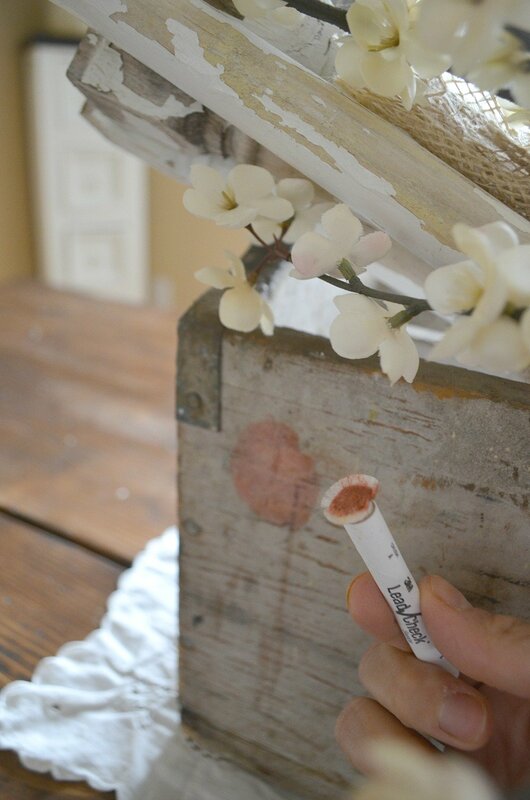 Today I’m sharing the results of my lead tests, showing you how easy it is to do, and also sharing my tips on protecting your family if any of your items do have that nasty lead paint. The federal government banned consumer use of lead-containing paint in 1978. 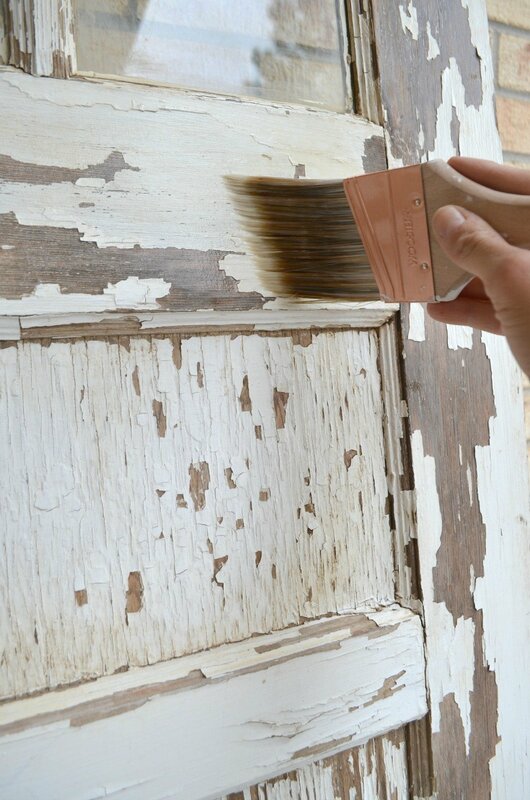 DO NOT sand or scrape on items with lead paint. 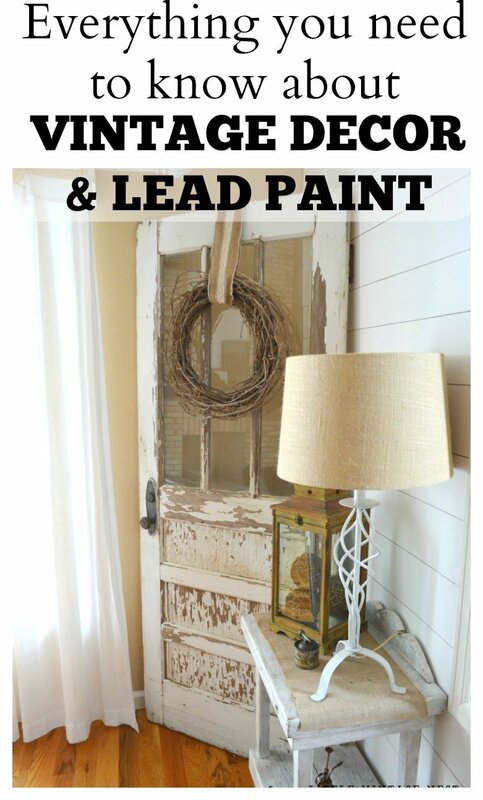 Clean items with lead paint using a rag and soapy water to remove any loose pieces of paint. Make sure to wash your hands and clean up really well after handling any item with lead paint. The EPA has lots of great info on lead paint, check it out here. First you’ll need a lead test kit. I use the 3M LeadCheck Swabs, they’re very cheap and super simple to use. Buy a few packs if you have lots of vintage decor like I do. Follow the directions on the package, but the basic gist is this: if the swab rubs red, it has lead paint. If it’s yellow, you’re in the clear. 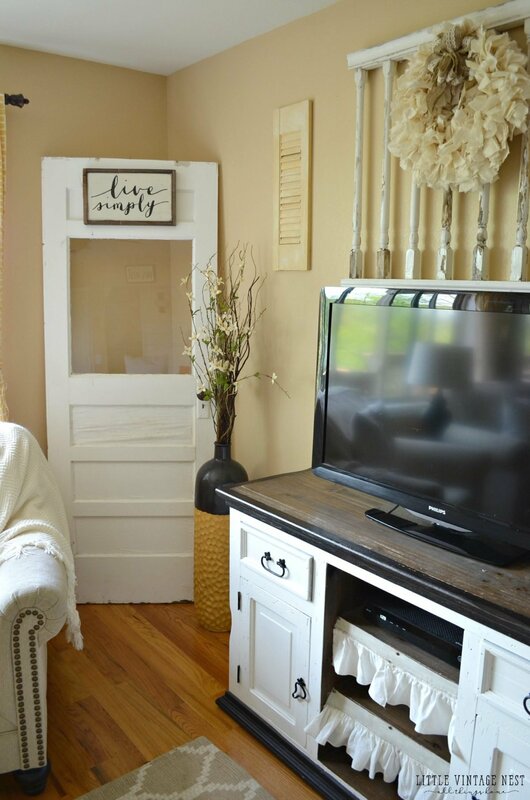 I tested out a variety of items in our home and the first was this old door in our front room. I’ve always worried about this door–it’s by far the most chippy piece I own. Yep. It showed up red almost immediately. And red means lead paint. Such a bummer, but I’m not surprised. This girl is old. Next up was the old crib we converted into a couch. This is another piece that is really old and I know it’s been painted because it’s chipping in a few places. Thankfully this one was negative for lead, you can see the yellow patch there under the swab. Good news! This old door in our living room is another one I’ve always wondered about. All clear on this one! 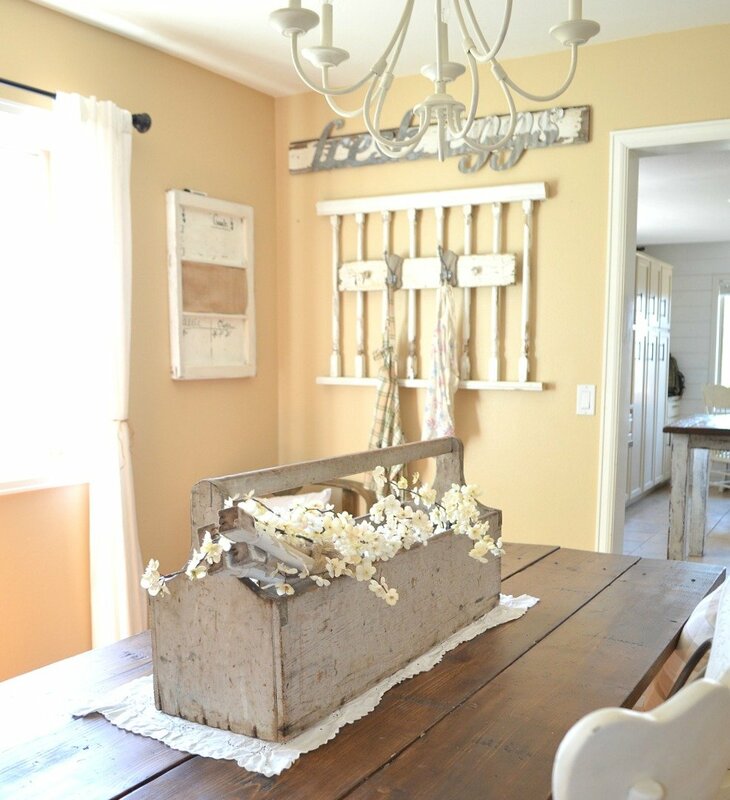 Next up is my vintage porch railings. 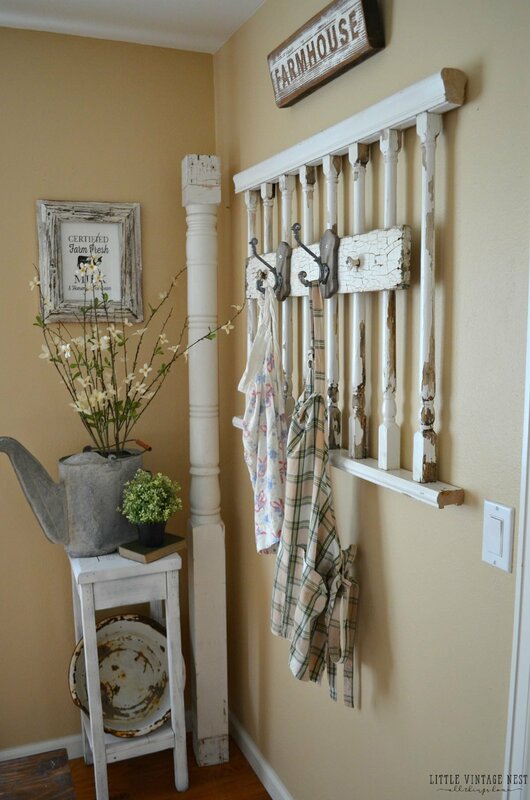 This one I converted into an apron rack, but I also have several old spindles scattered around our home from the same railings. And no lead paint here. Cue happy dance! Last up is my beloved toolbox that belonged to my Grandpa. Boom. It’s red. I was so sad to see this one show up. And it was immediate–as soon as the swab touched the toolbox it was turning red. I actually decided to try this one on a whim. I have never, ever thought this old toolbox would have lead based paint on it. Such a bummer. To clean the yellow and red spots off I used a wet paper towel and they rubbed right off. One of the tips I came across a lot in my research was the importance of sealing items with lead paint. The idea is to apply a protective coating that will prevent any further chipping or dust. For a while now I’ve been using the Bulls-Eye Clear Shellac Spray, which is super fast and simple to use. But I recently switched to the Bulls-Eye Clear Shellac Sealer because I wanted something a little more heavy duty and thick. 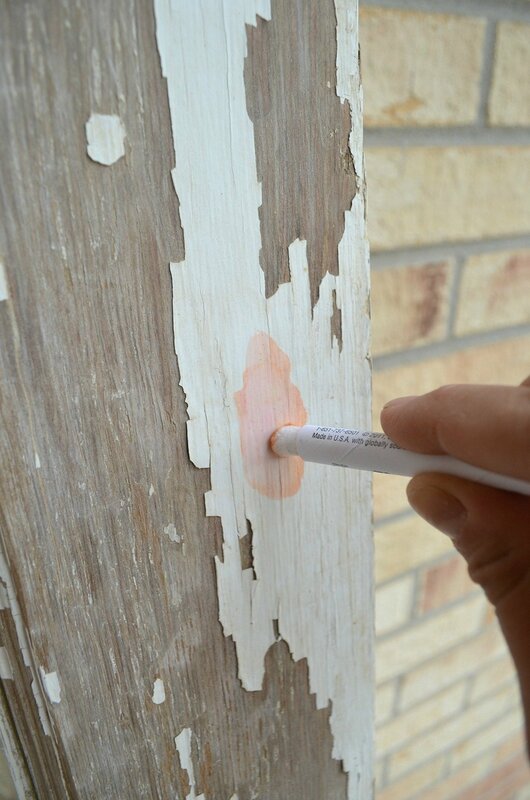 Simply paint the sealer on the piece to lock in the lead paint and keep it from chipping any further. After using both, I’d say I much prefer the liquid sealer over the spray version. I applied two coats and I honestly didn’t notice it change the color of the door at all. I’ll definitely be doing this on that old tool box. I will warn you, I could not get this sticky stuff to wash out of my brush, even with mineral spirits. So take my suggestion and use a foam brush so you can just throw the darn thing away afterwards! I know that’s a lot of info about lead paint, but I think it’s something to be educated on if you have vintage decor in your home. Some of my fears and concerns were lightened a bit after reading the real danger comes from inhaling the dust or eating the paint chips. 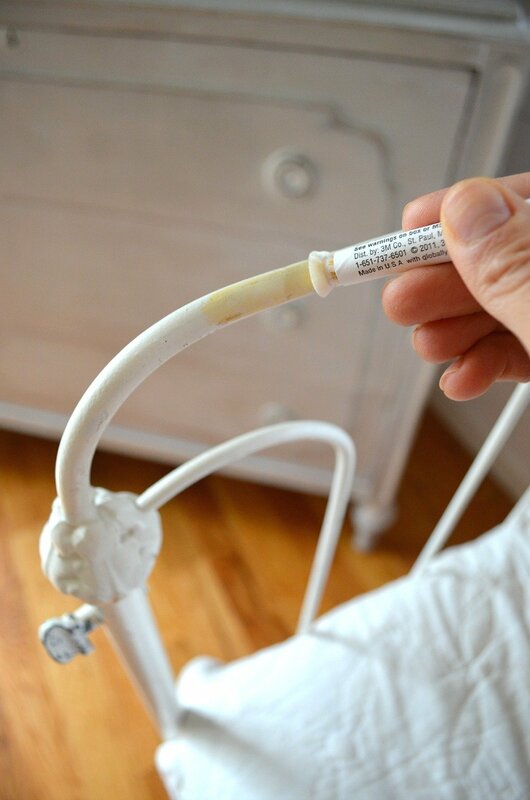 However I still think it’s a good idea to go ahead and seal those items you know have lead paint just to be extra careful–especially if you have little ones in your home. And even better, do your best to keep those pieces out of reach or in low traffic areas. Keep in mind my friends, I’m no expert. Not even close. But I do feel confident that the information I’ve researched and shared today is accurate. I hope this helps motivate you to check for lead on the vintage decor in your home. Let me know if you have any questions and I’d love to hear if you have any tips of your own to share! For sure Kathy! And congrats on being a grandma in January! Thanks for this post! 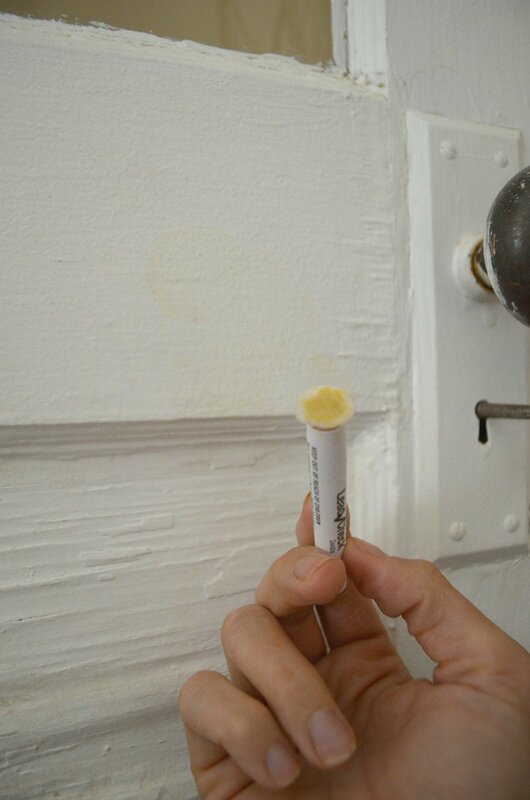 You always think about lead paint on walls (during home inspections, disclosure, etc. ), but it never really occurred to me to test any of the chippy decor, Good to know there’s a fix for it too! Great information Sarah! Thanks for sharing! Great info about the lead paint and the sealer too. So many things you hate to change the look of. I didn’t notice a change in the color with the sealer actually, it pretty much goes on clear. Hi Sarah, thank you for sharing this info. I would like to know if the yellow or red mark comes off after testing? Good question! I should have included that. Yes they do come off, I just used a wet paper towel. I never thought about some of my things having lead paint! I will be checking my pieces now. My kids are grown, but I do have grandkids around so thanks for all the information! Definitely a good idea to check just to be sure. Thanks for stopping by Brenda! Thank you for this helpful post! With little nephews running around, I’ve definitely been anxious about vintage decor. Do you think chalk paint would still apply well if I used the sealer you mentioned on a piece? I have an old window I love and need to paint white, but I want to make sure that it will be safe to display once I’m done! Great piece on safety….something a lot of us don’t think about with decor. Thanks for the info! Exactly the info I was looking for!! Thank you!! I like the recommendation to test the swap all over the home, not just the piece in question. 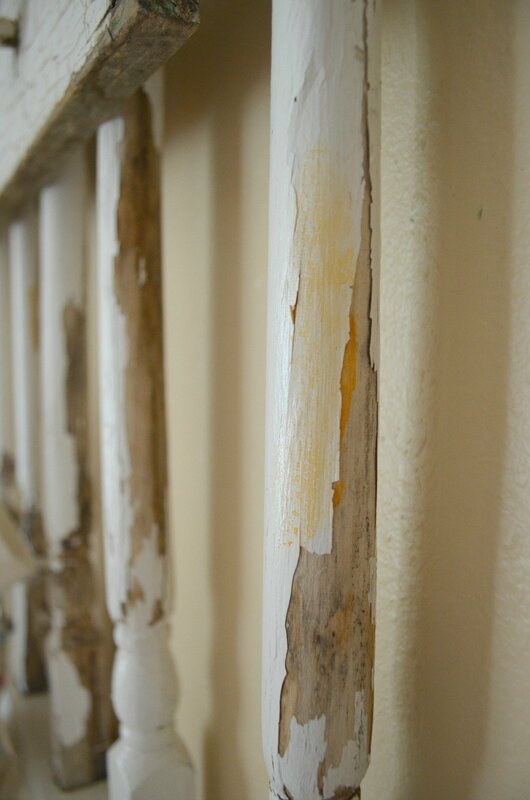 I’m wanting to buy a vintage home to restore and I think that lead paint is one of my biggest concerns. I’ll have to look into getting some of these swabs and testing it and having a company come out to remove the paint if it’s a problem. Thanks for sharing! Denatured alcohol will take the shellac out of your brush. Or just save the brush and only use it for shellac since you can simply soak the brush in shellac and it softens up again. 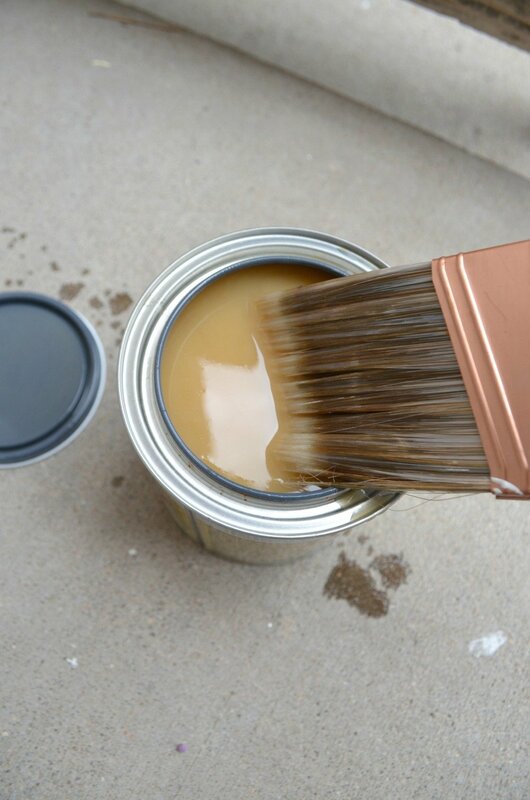 I’d also recommend pouring your shellac into a disposable cup then dipping the brush in so that you don’t taint the whole can with chips that could show up in other projects. Shellac is a GREAT product to use. The BIN shellac based primer is by far my favorite. These are just tips from my own experience! Great post! Great info for chipped pieces. From what I read, I thought you needed to cut or scrape down to the wood or metal before testing. I have heirloom pieces to refinish that have a dark stain or varnish on them, not paint. When I tested them the brush turned a shade of maroon. I took that to be a “shade of red” positive lead result. It is good to hear I may be able to just seal them! Thanks for the info! I never thought about testing the furniture pieces but i guess i need to do that. I do use Shellac on my older pieces and if you soak your brush in Ammonia it will clean it out. I have marked a brush for shellac only too. Thanks for all your post!! Thank you, Sarah, for the post! We recently rescued some old doors from a house on one of my parents farms, and they have peeling paint on them. I knew about the dangers of lead paint and that it would be a bad idea to scrape or sand them. I had thought about power washing them to remove loose paint, but also had the thought that if we did that outside, our dogs could possibly ingest a piece of the paint. Something else I thought of is that there are probably vintage pieces out there that may have been painted multiple times, so the newest layer may be lead free, but older layers underneath may contain lead. Glad to know there are simple kits available to purchase! Can I ask how you cleaned your doors before sealing? I want to leave as much of the old paint as possible. Your home is lovely!! Hi Sandee. I cleaned the doors with hot soapy water. I just made a big bowl of it and wiped down the door. 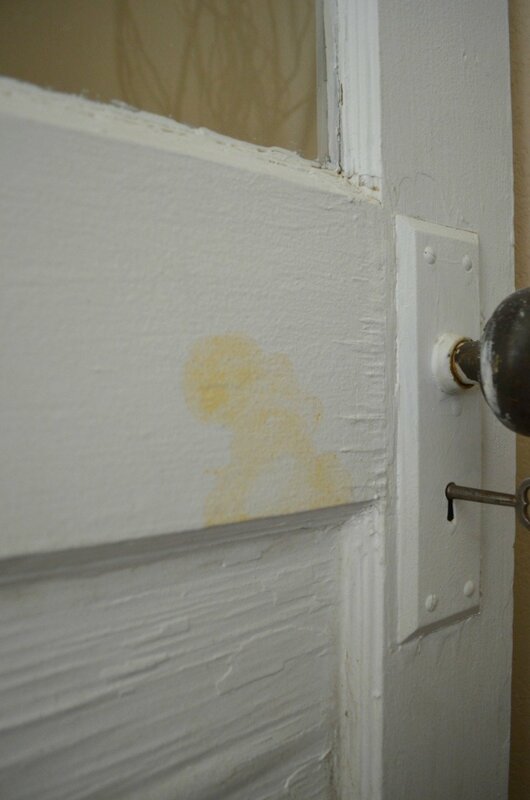 You have to be careful if there is any lead paint to not sand the door and create any dust, so definitely don’t do that. Just scrap off the pieces of paint that are loose and then wipe it down well with that soapy rag. Let it dry then go ahead and seal it. That’s how I do it anyway! Did you ever test the furniture again after the seal was added? Thank you! I have two 100+ year old doors from my childhood home that I wanted to use as barn doors in the new home we are building. I feel so much better about using them after reading this! Sarah, THANK YOU so much for posting this information. I have shared it on the HOMETALK site and hope you don’t mind. Too many people find old doors and what not and do not give one thought to lead paint that may have been used on the item. Your research, solutions and links are greatly appreciated. Thank you for this. I was doing research for restoring my vintage dollhouse. Never would have thought to check it for lead paint! I ordered the tester. I too have several old doors and windows which I plan to use in my home and garden. My concern is that sealer will leave the pieces shiny and lose some of the rustic charm. I found dead flat spray sealer at my local Home Depot. Will that be sufficient to safely use the pieces? Now that it’s been about 2 years since you used the shellac, has it has kept the door from peeling/flaking? 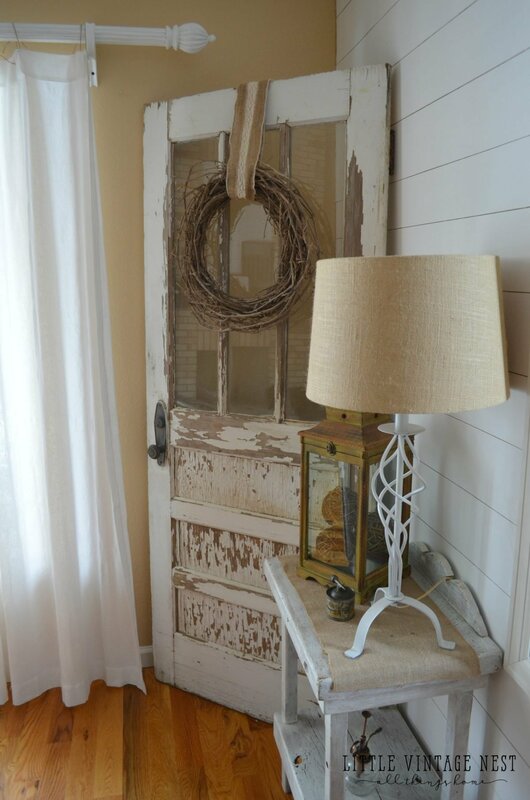 I have shutters I want to hang on either side of a big mirror in my entryway. They have tested positive for lead…which is quite chippy too! They are a bit too long compared to the height of the mirror so I was thinking about cutting them (there’s a perfect spot at the bottom and top that won’t change the look of the shutter), but I’m nervous about the dust and the cleannup, even outside where my two year old plays. How would you tackle this? Would you just leave them too long and not sacrifice health and safety over a perfectly decorated home? I’m so torn. Please, please, please do not put those in your house. Properly dispose of them immediately. My daughter has elevated lead levels and I will tell you it is not worth it. Not in the least. The effects of lead poisoning are permanent and irreversible. I did a masters degree from Penn on the subject as well and would count myself as expert level of knowledge about lead hazard and prevention. Please trust me when I say do not use those doors in your house and certainly do not disturb any of the paint. Can you please tell me the symptoms that your daughter has? thank you so much fort information. I am presently decorating vintage windows and am fearful of lead paint. 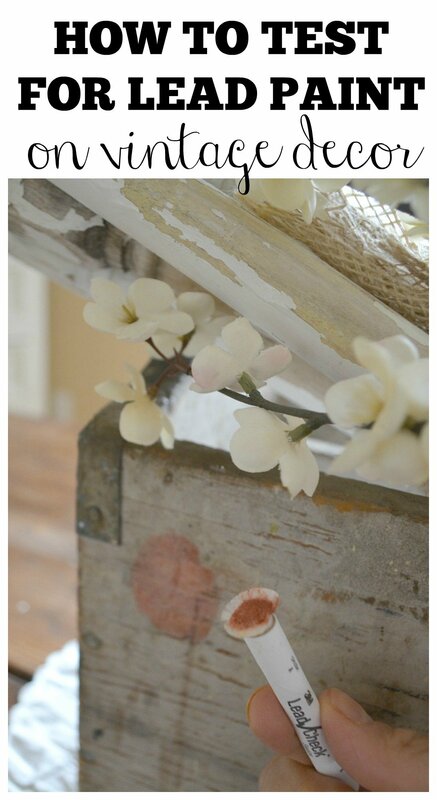 I know know how to do this without sanding and repainting with chalk paint.